In the spring of 1945, a new unit arrived on the British lines in northern Italy: His Majesty’s Jewish Brigade Group. 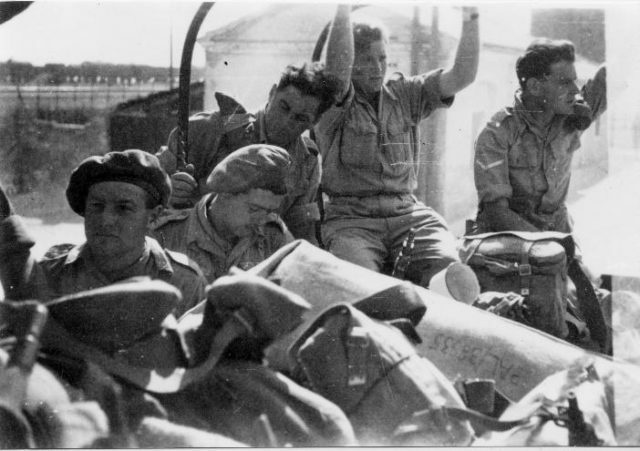 Made up Jewish volunteers from around the British Empire, many of whom were refugees from the Holocaust, the Brigade Group helped to secure victory in Italy, and ensure the peace in Austria and Belgium after the war. But arguably even more important than their military endeavors, was their involvement in the Jewish Underground. It had taken many years, and much persuasion to convince the British Army to the create the Brigade Group in the first place. The Foreign Secretary at the time was vocally Anti-semitic and understood the implications of such a unit gaining wartime experience and then returning to the British Mandate of Palestine, which had already seen one Jewish rebellion and didn’t need another. But the need for manpower outweighed the political fears, and the Brigade was formed and sent to Northern Italy to assist the final push in March of 1945. 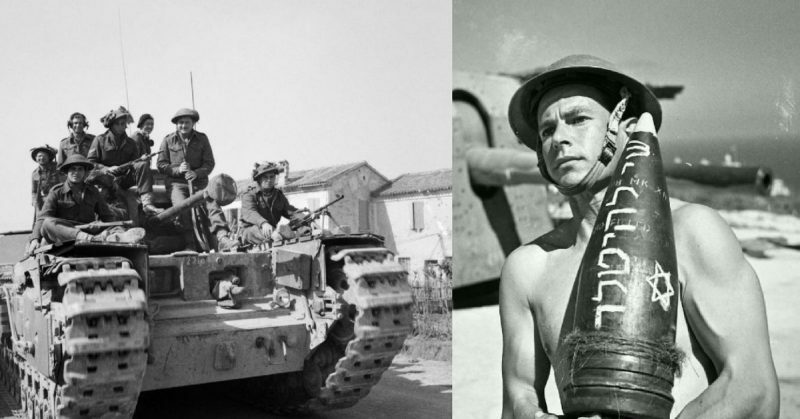 But the Brigade served more than just the British army, many of its members were refugees from Europe, citizens of Palestine, or had lost family in the Holocaust. There was an underground movement within the unit, supported by the Jewish Agency, an international Zionist movement which was trying to bring as many refugees to Palestine as they could. The Agency knew that the war for Israeli independence was coming, and they would need soldiers. 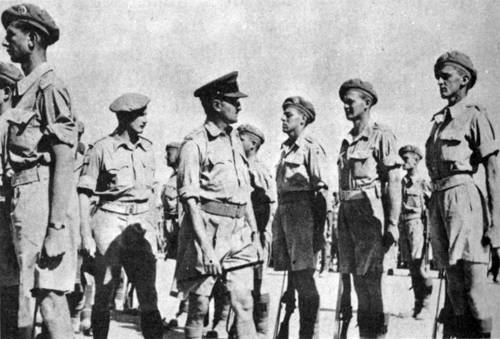 Just after formation, the Brigade is reviewed by Brigadier Ernest Benjamin in Palestine, 1944. The Brigade was moved to Tarvisio on the Italian/Austrian border, a small city isolated in the Alps, but located at the intersection of Austria, Italy, and Yugoslavia. In other words, it was a crossroads. 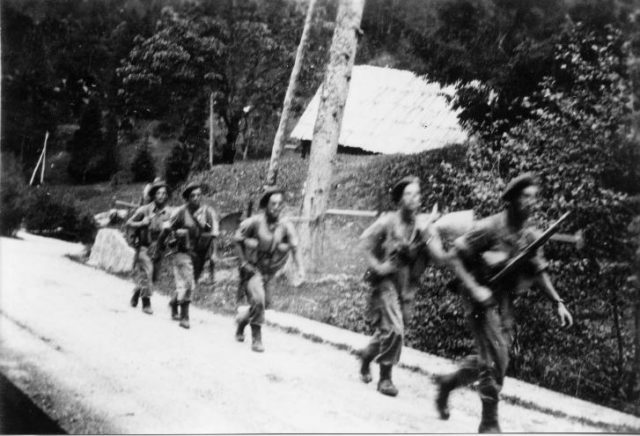 And as Holocaust survivors fled south, towards the Mediterranean ports, many passed into Tarvisio and were greeted by an amazing sight: 5,500 Jewish soldiers. For the Jews of Europe, the thought of Jewish Soldiers was inconceivable. They had seen entire communities wiped out in days, and knowing that there Jewish men who were fighting back, wearing the Star of David on their shoulders, and speaking Yiddish gave them something they’d lost many years ago: hope. The Jewish Agency had many plants in the Brigade who immediately began working towards organizing the outpouring of refugees. They established small camps to house them, feed them, and clothe them while there the Brigaders listened to their stories, and learned about the true extent of the horrors which had gripped Germany and Europe for the past decade. This solidified the resolve of every member of the Brigade, Zionist or not, and a plan for escape was devised. The Brigade’s motor pool housed large transport vehicles, perfect for moving personnel around Europe unnoticed, what was one more army truck passing through a checkpoint? 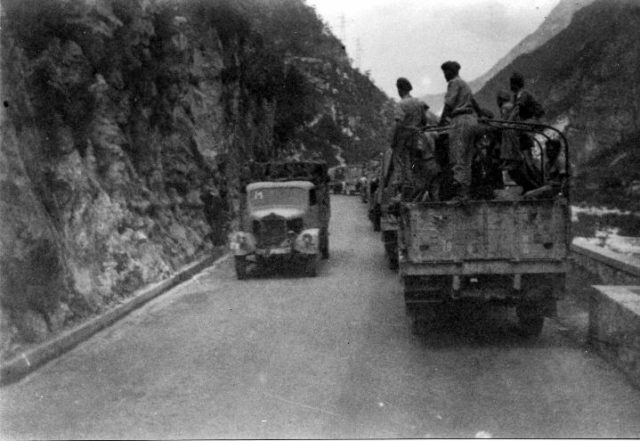 The Brigade would fill these trucks with Refugees, close the flaps, and send them down to Naples or other ports, where they would board waiting ships organized by the Jewish Agency. 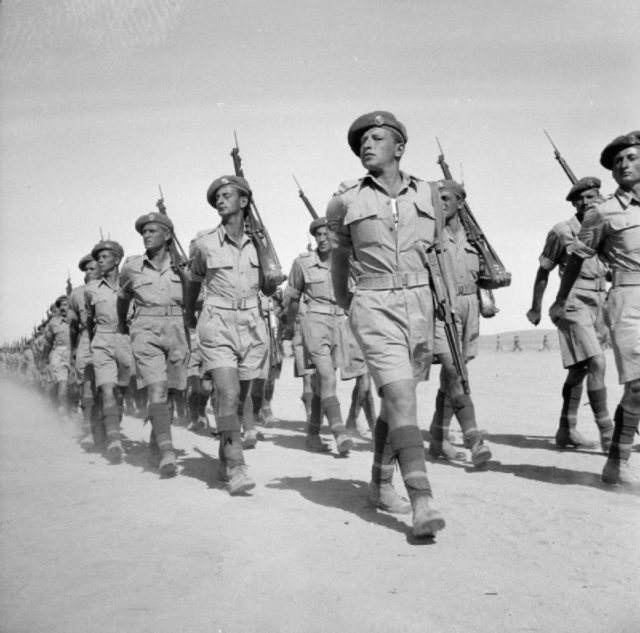 1st Battalion of the Jewish Brigade on parade. Though technically illegal, by both political and military laws, the operations were usually overlooked by the other members of the British Army, who often felt sympathy for the Jewish plight. To help facilitate this, one Brigader, and Jewish Agency member, Israel Carmi, created an entirely fictitious unit, the TTG. The acronym seemed like any other British Army unit and was supposedly a transport group for Prisoners of War. In reality, it stood for “Tilhas Tizig Gesheften”, “up yours” in a combined Yiddish-Arabic phrase. Carmi, with the help of some of the former artists in the unit, forged mountains of paperwork, all supposedly signed by the Brigade’s CO, Brigadier Ernest Benjamin. Carmi then set about gathering supplies for this fake unit. He requisitioned trucks, supplies, blankets, and food from other transport groups all over Europe. The TTG went out and gathered as many Jewish children as they could, from camps, towns, and anywhere else. Then smuggled them all back to Italy, where other Jewish Agency members would sneak them onto boats bound for Palestine. But rescuing refugees wasn’t the only goal for the Brigade; they also had to train an invisible army. They knew that there would be fighting to do in the not-too-distant future. There were many armed Jewish organizations in Palestine at the time, each with a different political backer, and each vying for power. This created a fractured defense, which would collapse against an organized military. David Ben Gurion, future Prime Minister of Israel and leader of the Zionist movement, understood the need for a well-trained, centralized and disciplined army. He knew that this was the only way to fight against the far better organized Arab nations which would surround any future Jewish state in Palestine. To create this army, the Jewish Agency ordered the Brigade to select the fittest and most mentally stable of the refugees for training. They were fitted out in Brigade uniform and got an understanding of military discipline and lifestyle. The men learned fieldcraft, combat tactics, and how to fight a major war. Many of them were partisans, who knew about ambush and hand to hand combat, but not about large troop movements. This is what the Brigaders knew best, and they were excited to pass on their knowledge. 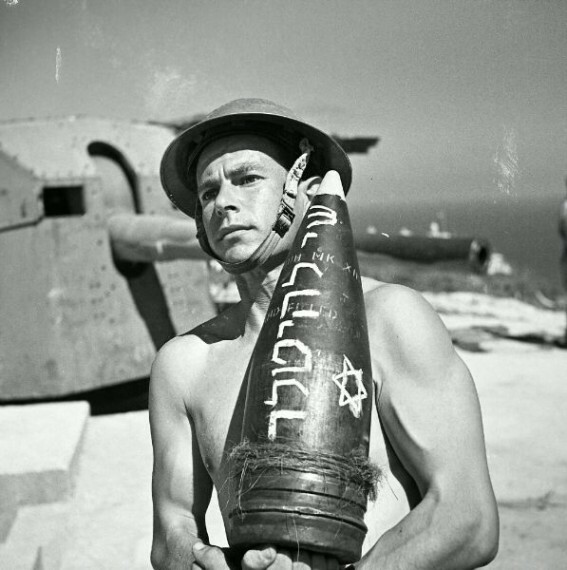 A Jewish Brigade soldier carries an artillery shell. The Hebrew inscription on the shell translates as “a gift to Hitler.”. They took these refugees out in the field, saying they were Brigade replacements who needed combat training, and taught them everything they knew. After a few weeks of training, the men would be smuggled onto ships, and sent back to Palestine to train more refugees there. While there are no solid numbers for how many of these men were trained, it is estimated at around 700, and they served as the cadre around which the later Israeli Defense Forces would form. But after many months in Tarvisio, the Brigade was moved to Belgium. Here they had one last ditch attempt to save lives. By the summer of 1946, the Brigade was to be disbanded, the Army finally bowing to political pressure and recognizing the amount of illegal activity engaged in by Brigaders. But in a final act, 100 men from the Brigade shed their uniforms, paybooks, and history and gave these to refugees. These men were taught everything there was to know about the men they’d replace, and learned their entire life history. These 100 refugees were demobilized in Palestine with the rest of Brigade, and those 100 Brigaders left in Europe went on to continue organizing the escape of refugees. By the time travel to Palestine was opened up in 1946, the Jewish Agency had trained, experienced and skilled soldiers who were ready to train more. The wave of refugees which hit Palestine was quickly incorporated into a fledgling army and readied for the War for Independence. Many of the Brigade veterans went on to be officers in the new Israeli Defense Forces, 35 of them even became Generals. While it is hard to say exactly how important the Brigade was regarding numbers of people saved, it is clear that their skill and esprit de corps helped to form the bedrock on which all future Israeli military organizations have rested.